HOUSTON, TEXAS (February 28, 2014) Pitching 8.2 innings of baseball, Houston Cougars starting pitcher Aaron Garza held Texas Tech scoreless as the Cougars downed Texas Tech by the score of 9-0 in the first game of the Houston College Classic at Minute Maid Park in Houston on Friday, February 28, 2014. The Cougars scored in the first inning on a double by first baseman Casey Grayson, sending shortstop Frankie Ratcliff home from second. After five innings of scoreless baseball, Houston exploded in the seventh inning, scoring eight runs on four hits to close the door on Texas Tech. Third baseman Jacob Lueneburg was three-of-four at the plate, scoring one run and three RBI. Kyle Servance, Ratcliff and Grayson all connected for two hits each while Ashford Fulmer tallied one hit.Garza, who was crediting with the win, faced 33 batters and threw 115 pitches; finishing the game with a 0.41 ERA. He gave up six hits while struck out seven and receiving his third win of the season. Dominic Moreno received the loss for Texas Tech giving up one run on five hits. Dalton Brown and Matt Custard, pitching in relief, gave up four runs and three run respectively, with Custard’s ERA raising to 67.60. 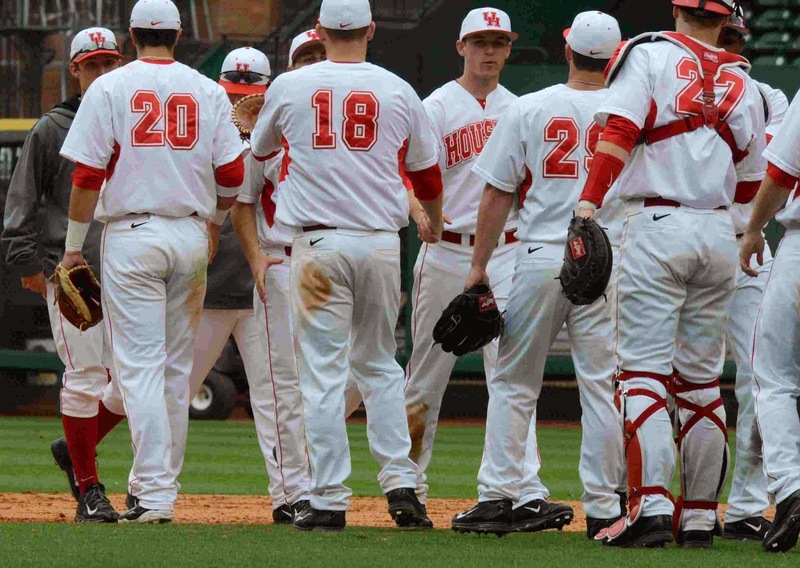 The Cougars raised their record to 9-0 and will face the Texas Longhorns at 3:35 p.m. on Saturday, March 1, 2014. Texas Tech, which fell to 8-3 on season, will play Rice on Saturday, March 1, with a 7:05 p.m. first pitch. Rounding out the first day of play the Houston College Classic; Sam Houston State faces TCU at 3:35 p.m. while Rice plays Texas at 7:05 p.m.
Texas Tech is currently ranked No. 26 in the Baseball America poll, while Rice is ranked No. 10, Texas is No. 15 and TCU is No. 12. The Houston College Classic continues through Sunday, March 2. HOUSTON, TEXAS (January 27, 2014) Facing their third ranked team of the season, the Houston Cougars came out swinging and in doing so, upset #21/22 Memphis by the score of 77-68 in front of 3,628 fans in Hofheinz Pavilion in Houston, Texas on Thursday evening, February 27, 2013. The game was an extremely close match; with Houston leading by as much as nine with 14 seconds remaining in the game, while the Tigers were ahead by four at the 15:32 mark in the first half. In the slug out match, the score was tied seven times and the lead changed 13 times. TaShawn Thomas had one of the best game of his career; connecting for 16 points with seven rebounds and three blocked shots. He connected on six-of-seven from the field and four-of-six from the free throw line. With his Thursday evening performance, Thomas became the seventh player in Houston Cougars history to score 1,300 points and pull down 800 rebounds in his career. However, outstanding performances were not limited to Thomas. Danuel House was a scoring machine on the floor; sinking 19 points and shooting five-of eight from the field along with three from behind the arc. He was six-of-nine from the foul line. Head coach James Dickey commented on House’s success at the free throw line. Jherrod Stiggers contributed to Houston’s scoring effort; accounting for 14 point while pulling down four rebounds. Starting guard L.J. Rose pulled down seven rebounds, all on defense, while making 10 assists and shooting five-of-six from the free throw line. With the upset win, the Cougars will have little time to celebrate. They board a plane on Friday morning; travelling to Philadelphia for an 8 p.m. match-up against Temple on Saturday, March 1. Following the trip to the City of Brotherly Love, they will return to Houston for their final home game of the season against South Florida on Tuesday, March 4. Houston will close out the regular season on the road against Central Florida on Friday, March 7. With three games remaining, the Cougars are in sixth place in the American Athletic Conference. The top six teams receive first-round byes at the conference tournament to be held at the FedEx Forum in Memphis, Tennessee on March 12-15. Currently, Temple is 2-14 in conference play after losing to Louisville on Thursday evening. South Florida is two places behind Houston in the standings with a 3-12 record, while Houston's final regular season opponent, Central Florida, is 3-11 in conference play. HOUSTON, TEXAS (February 23, 2014) With a three-run double by center fielder Ashford Fulmer, the Houston Cougars remained undefeated in 2014 with a 4-3 win over the Michigan Wolverines at Cougar Field in Houston on Sunday, February 23, 2014. Houston swept the Wolverines in the three-game weekend series by the score of 2-1 on Friday, February 21 and with a 10-inning effort in their 1-0 win on Saturday, February 22. Kyle Survance got the Cougars on the scoreboard in the first inning; sending Josh Vidales home from first base off a double down the left field line. The Wolverines came back in the second inning to tie the score when Kendall Patrick connected on a 1-1 pitch; sending the ball over the left field wall for his first home run of the season. They added two more runs in the fourth inning when Patrick singled to right field; scoring Jacob Cronenworth and Kyle Jusick from second and third, respectively. Houston entered the seventh inning down by two runs when they quickly loaded the bases on three straight singles, allowing Fulmer to send home the winning runs. Relief pitcher Bubba Maxwell (1-0) got the win for the Cougars, with Chase Wellbrock, pitching two innings in relief, got his third save of the season. Brett Adcock (0-2) received the loss for Michigan. Third baseman Justin Montemayor accounted for two of Houston’s hits on Sunday and tallied four hits on ten at-bats for the three-game series. With the loss, Michigan drops to 1-5-1 for the season. Next up for the Cougars will be a 6:30 p.m. home match-up against the McNeese State Cowboys on Tuesday, February 25. Following Tuesday’s game, Houston will play in the Houston College Classic at Minute Maid Park on February 28-March 2. They will face Texas Tech on Friday (February 28) with a 12:05 p.m. first pitch; followed by a 3:35 p.m. game against Texas on Saturday (March 1). They close out the tournament on Sunday, March 2 with a 5:05 p.m. game against TCU. HOUSTON, TEXAS (February 22, 2014) Led by Danuel House’s 18 points, the Houston Cougars raised their conference record to 5-9 by defeating Central Florida by the score of 88-84 at Hofheinz Pavilion in Houston, Texas on Saturday, February 22, 2104. With the win, the Cougars also raised their season record to 13-14 with four games remaining in the regular season. House was virtually unstoppable, playing for 29 minutes and connecting on 3-of-5 from the field and 8-of-8 from the line. He also was 2-of-3 from three-point range. Three other Houston players scored in double figures: Jherrod Stiggers (17), L.J. Rose (12) and TaShawn Thomas (11). The game stayed fairly even, with the score being tied 14 times, until the 18:26 mark in the second half. At that point, the Cougars began to slowly pull away, achieving an eight-point lead at the 10:02 mark and extending the lead to 10 point with 55 seconds remaining on the clock. Defensively, Houston pulled down 21 rebounds, with Thomas and Brandon Morris accounting for four each. They scored 24 points on offensive turnovers and 11 second-chance points. From Central Florida, Tristan Spurlock scored 21 points, followed by Isaiah Sykes with 19 and Kasey Wilson with 10. Houston shot 58% (28-28) from the field, as opposed to 47% (31-65) for the Knights; with the Cougars connecting on 10-of 16 from behind the arc. With four games remaining on their regular schedule, the Cougars are currently in sixth place in the ten-team standings. Cincinnati leads the conference with a 13-2 record, followed by Louisville at 12-2. They are followed, in third place, by SMU (10-4) with Connecticut and Memphis tied in fourth at 9-4. That follows with Houston in sixth, with Rutgers (4-10), South Florida (3-11), Central Florida (2-12), and Temple (2-11) rounding our the standings. The Cougars have two home and two roads games remaining. The face #22/24 Memphis at home on Thursday, February 27, followed by a March 1 match-up with Temple on the road. They return to Houston for their final home game of the season against South Florida on Saturday, March 1 and finish the season on the road with their second match-up against Central Florida. HOUSTON, TEXAS (February 14, 2014) Paced by a home run by first baseman Casey Grayson, the Houston Cougars held off a late game assault by Nicholls State; downing the Colonels by the score of 3-0 on opening night of college baseball at Houston’s Cougar Field on Friday, February 14, 2014. The Cougars added runs by second baseman Josh Vidales and right fielder Kyle Survance, in the bottom of the eight inning, to insure the shutout of Nicholls State. Houston starting pitcher Aaron Garza saw seven innings of work; giving up two hits while striking out six. He showed pinpoint control in his first outing of the season; throwing 61 strikes on 88 pitches. Grayson, who was 3-for-3 with one run and one RBI, showed he will be factor for the Cougars in 2014. Nicholls State mounted a comeback in the eighth inning with singles by Phillip Lyons and Justin Holt, however, they were unable to get any runners to score. Chase Wellbrock, who pitched two innings of relief and gave up three hits while striking out five, got the save received the loss. Houston head coach Todd Whitting was pleased with Garza’s effort on the mound and expressed that to the press after the game. Whitting indicated that Garza was on a pitch count this early in the season, but didn’t view that Garza was in trouble when Wellbrock was sent into the game in relief. The Cougars will face the Colonels twice more on opening weekend. They have a 6:30 p.m. match set for Saturday, February 15 and a 1 p.m. first pitch set for Sunday, February 16.
in their 88-74 win over the Temple Owls. HOUSTON, TEXAS (February 9, 2014) The University of Houston men’s basketball team jumped out to a 40-29 lead at halftime and continued to dominate a depleted Temple squad in the second half by downing the Owls 88-74 at Hofheinz Pavilion in Houston, Texas on Sunday afternoon, February 9, 2014. The Cougars have an effective offensive presence on the court; with four players scoring in double figures. TaShawn Thomas, who also tallied nine rebounds, connected for 25 points, while Jherrod Stiggers connected for 20, Danuel House adding 16 and Brandon Morris contributing 15. The Owls took at four point lead at the 17:25 mark in the first half and that was the last time Temple was ever than close. Temple, who only suited nine players for the game due to injuries, tried valiantly to keep pace, but with Houston head coach JamesDickey substituting players as will, the Owls quickly found themselves over-matched and outpaced. Houston had a 21 point lead with just over three minute remaining in the half, but that lead quickly dwindled in the second half. their season average of 50.5% in addition to scoring 22 points of the bench. The major factor in the game was fast break points, with Houston connecting for 14 points as opposed to only tow for the Owls. Teamwork was also a key factor for the Cougars, who tallied 22 assists. For Temple, Dalton Pepper led all scorers with 17 points, followed by Anthony Lee and Quenton Decosey with 14 each. Houston will now have six days to prepare to face their fourth nationally ranked opponent for 2013-2014 as they travel back east to play number seven ranked Cincinnati on February 15. Naismith Memorial Hall of Fame. HOUSTON, TEXAS (February 5, 2014) Despite a strong second half, the Houston Cougars were unable to overcome a strong offensive effort by the Louisville, and fell to the Cardinals by the score of 77-62 in front of 7,247 fans at Hofheinz Pavilion in Houston, Texas on Wednesday, February 5, 2014. With the loss, the Cougars fall to 11-12 for the season and 3-7 in conference play. Three Cougars scored in double figures with TaShawn Thomas and Jherrod Stiggers connecting for 14 points each; followed by Danuel House with 11. However, that was not enough to overcome the scoring punch of the Cardinals. Russ Smith led the Louisville scoring with 17 points, followed by Luke Hancock and Montrezl with 15 each and Chris Jones with 14. The closest the Cougars got to Louisville was at the 14:12 mark in the first quarter, when the score was tied at 11. In fact, the Cougars outscored the Cardinals 36-32 in the second half, but that was not enough to overcome the 19-point deficit of the first half. Both teams pulled down 29 rebounds with Louisville holding advantage on defensive boards (23-20) while Houston lead on the offensive end of the court (9-6). The lost was bittersweet for the Cougars, coming on the night that the university honored legendary basketball coach Guy V Lewis for his induction into the Naismith Memorial Basketball Hall of Fame. Lewis was inducted into the Hall of Fame’s 2013 class along with current Louisville head coach Rick Pitino. With the loss, Houston has dropped its last five games and seven of its last eleven. Louisville came into the game ranked #14/10 in the country and was the second time this season they have faced a nationally ranked opponent. 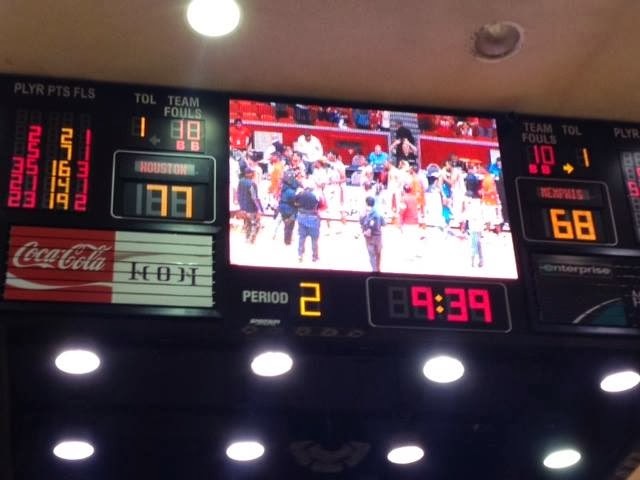 On New Year’s Eve, 2013; Houston played #17/14 Connecticut and drowned the Huskies by the score of 75-71. Louisville led 23 points at the 19:13 mark in the second half, when the Cougars went on a scoring drive. Houston began witling down the Cardinal lead until they got within nine points of Louisville with 6:39 remaining in the game. After that, the Cardinals kicked it into overdrive and came away with the 15 point victory. HOUSTON, TXEAS (February 1, 2014) Minute Maid Park welcomed college baseball action back to Houston, Texas in the form of the second annual Winter Baseball Invitational on Saturday, February 1, 2014. Three games were played on the opening day of the tournament, with the first game featuring the Arkansas-Monticello Boll Weevils and Arkansas Tech Wonder Boys. Booster by two multiple run innings, the Boll Weevils downed the Wonder Boys by the score of 7-2. Designated hitter Austin Braddock went 3-for-5 at the plate, including one run and two RBI. Second baseman Ben Agredano contributed with two runs one hot and one RBI. For the Wonder Boys, third baseman Jay Johnson had one run on one hit. Josh Mingura received the win; pitching five innings, while giving up two runs on six hits. Game two saw Winona State come from behind in the seventh inning to down Henderson State, 3-2. The Warriors used a balanced attack to down the Reddies, limiting them two eight hits and only two runs. Henderson State took a 2-0 lead in the third inning with Warriors coming back with two runs of their own in the fifth. Starting pitcher Mike Wasilik threw four innings, giving up two runs on six hits. Joseph Kubera , pitching two inning of relief, received the win while Steven Brooks, pitching 2.1 inning of revief, received the loss. Game three had St. Mary’s scoring the go ahead run in the top on the ninth inning to give Rattlers a 5-4 win over Central Missouri. St. Mary’s jumped out to and early 4-0 lead by the fourth inning, followed by a single run by Mules in the bottom of the inning to make the score 4-1. The Mules scored one more run in the sixth and two in the eighth inning to tie the score. Mario Maldonado, pitching 1.2 innings of relief got the win with Kyle Gehrs received the loss. The tournament, which is the brainchild of Houston Astros owner Jim Crane, will continue on Sunday, February 2, 2014 with three games scheduled for 10 a.m., 2 p.m., and 6 p.m.